Samantha Kingston is one of the most popular girls in school, and she knows it. Together with her best friends Lindsay, Elody, and Ally, the foursome rules Thomas Jefferson High School. But everything about life that Sam took for granted abruptly loses its meaning on the way home from a party one night. Forced to relive the last day of her life for a week, Sam gets an unflinching look at the kind of person she was and how she treated people. With this insight into how others perceived her, she has the chance to try and right some of the wrongs in her past, if she chooses to do so. 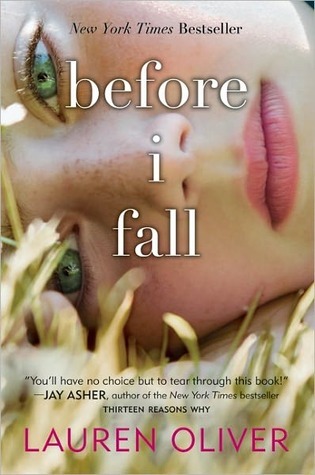 Having read and enjoyed Lauren Oliver’s Delirium and Pandemonium, I was very eager to check out her contemporary novel, Before I Fall. I shouldn’t have been surprised to find it every bit as intense and thought-provoking as her dystopian books, as well as written in her signature, elegant prose. To think that this was Oliver’s debut novel is staggering. Samantha Kingston starts out as one of the most unlikable protagonists I’ve read about in recent memory. She’s shallow, self-absorbed, and stuck-up. She and her three best friends, Lindsay, Ally, and Elody, exemplify the definition of mean girls. They sneer at everyone because they can. Although Sam isn’t as outwardly aggressive as Lindsay, the ringleader of their little clique, is, guffawing at every vicious remark Lindsay cracks about someone and never speaking out against Lindsay’s bullying doesn’t make Sam much better than her friend. Sam isn’t very nice at home, either, especially to her younger sister, Izzy. The laid-back attitude of Sam’s parents toward their daughter’s behavior really bothered me. They didn’t seem to have much of a problem with her attitude, when she clearly needed a stern lecture at the very least. As repulsive as I found the actions of Sam and her crew, in particular Lindsay’s determination to make life a living hell for her former friend, Juliet Sykes, this story was absolutely riveting. When Sam first realizes that she’s died, she’s defiant, acknowledging that she’s done some bad things, but did she really deserve this fate because of them? Each time she relives her last day, though, she gains a clearer picture of her true self, the arrogant girl who found the public humiliation of others hilarious and just watched as it happened. Sam also opens her eyes to the type of people her friends really are. But this epiphany isn’t only about seeing Lindsay’s cruelty for what it is and not finding it funny anymore. We learn that despite her friends’ swagger, their lives aren’t as perfect as they would like people to believe they are. Oliver is very careful not to justify the girls’ behavior; she puts forward some possible reasons why they act as they do, but it’s up to the reader to decide what to make of these characters, including Sam. I liked that Oliver gave the reader this freedom and didn’t try to sway you into neatly categorizing a character as good or bad. Although I still didn’t love Sam by the end of the book, I do think that she matured a great deal and learned a huge lesson in compassion. What I loved most about Before I Fall was how it evoked so many conflicting feelings. I couldn’t stand some of the characters, yet I couldn’t stop reading about them. I usually struggle with books featuring less than likable main characters, and Sam is definitely not your conventional YA heroine, but I was completely absorbed by her attempts to rewrite the final chapter of her life. I’d love to see Lauren Oliver write another contemporary novel; it’s sure to be another gripping read that leaves you a jumble of emotions once you’ve reached the last sentence. Obviously, this is a must-read for any Lauren Oliver fans. I also recommend it if you’re up for a book that challenges its readers to take a good, introspective look at the way in which our words and actions affect the people around us. I am so glad you reviewed this one. I've backed away from it because I am so character driven and thought I could not possibly love a book with such a mean main character. But I too loved Delirium and Pandemonium, so was interested in this one. I'll have to give it a try! When I started reading, I worried about the same thing, that it was going to be nearly impossible for me to like a book with such an unlikable protagonist. I loved the book, though. I'm looking forward to hearing what you think of it! I've seen recommendations for this book everywhere lately! It's definitely been added to my TBR pile. It can be a tough read at times, but it's really worth sticking with it. Lauren Oliver is such an amazing writer. Sam did grow a lot by the end of the book, and I liked how her character development happened gradually and not in the blink of an eye. Delirium is awesome; I hope you get to read it soon!